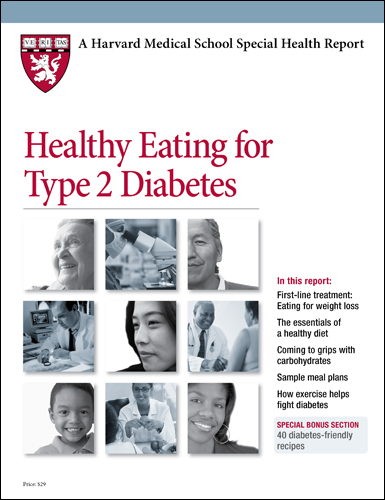 In this report, Healthy Eating for Type 2 Diabetes, you’ll learn about the components of a healthy diet for people with diabetes, as well as how to work with a dietitian, how to develop a meal plan, and how to fit physical activity into your schedule. You will learn how to recognize portion distortion, make wise choices while dining out, and stay on track with your weight-loss plan. Best of all, we’ve included 40 original recipes so you can put this advice into practice — starting today. Many people with diabetes wonder how they’ll need to adapt their eating habits. Myths abound when it comes to diabetes and food — one of the most common being that there is a “diabetes diet” that prohibits sugar and lists other items to avoid. That’s not the case, but it is important to follow a healthy diet that emphasized controlling weight and keeping blood sugar, blood pressure, and cholesterol values as close to normal as possible. In this report, you’ll learn about the components of a healthy diet for people with diabetes, as well as how to work with a dietitian, how to develop a meal plan, and how to fit physical activity into your schedule. You will learn how to recognize portion distortion, make wise choices while dining out, and stay on track with your weight-loss plan. Best of all, we’ve included 40 original recipes so you can put this advice into practice — starting today. Eating out is a way of life for many people. Many of these meals are purely a matter of convenience: a sandwich from the supermarket deli counter, drive-through burgers, or take-out Chinese food. Ask how the food is prepared. Talking with the restaurant staff before you order about the various menu selections and how they’re prepared will help you make appropriate choices. Look for less. Consume less saturated fat and fewer calories. Skinless chicken, fish, or lean meat that’s been broiled, poached, baked, or grilled is a more health-conscious option than fried foods or dishes prepared with heavy sauces. Practice portion control. Use your estimating techniques to size up the food on your plate. If it looks like there’s more food on your plate than your meal plan calls for, section off the serving size you want and ask for a “doggie bag” to take the rest home. Do your research. Detailed nutrition information on various menu items is available for most fast-food chains. Check out www.calorieking.com for a listing of over 50,000 foods, including many restaurant items. You can also visit company-specific websites (such as www.mcdonalds.com or www.pizzahut.com) for nutrition breakdowns, or call and request a pamphlet. Many locations display posters with this type of nutrition information. Keep track of the time. If you take insulin and know your meal will be delayed, eat a roll or piece of fruit to tide you over.